A record 168 grid penalties were assigned in total for today’s Italian Grand Prix starting grid. One hundred and sixty eight. Seven of the twenty drivers were affected. Manor Marussia’s Will Stevens now starts 13th, for Pete’s sake. Is this season over yet? Here’s the shakedown of who got penalized for what. Marcus Ericsson drops three grid places for impeding Nico Hülkenberg during qualifying, per RichardsF1. This is the only one that’s not ridiculous, but deserved. Dude just got in the way, and you can’t do that when someone’s on a flying lap. F1Fanatic also reports that Ericsson received two points on his super license, bringing him to a total of seven points against him. According to WTF1, the rest of the penalties are all because teams can’t get these stupid power units to work. Renault and Honda powered cars — surprise, surprise — are the ones affected. Carlos Sainz gets a 35 place penalty for changing multiple power unit components. Daniil Kvyat also gets a 35 place penalty for changing both a gearbox and power unit components. Daniel Riccardo is the biggest loser of them all, receiving a fifty place grid penalty for changes to his power unit. McLaren Honda’s pair of cars gets penalized, but actually benefits from the penalty overkill this time. Jenson Button had a five place penalty for a power unit component change and Fernando Alonso got a ten place penalty for a power unit component change, but both drivers move up one place to 15th and 16th, respectively. Button is at least positive that lap one will be some fun for them. 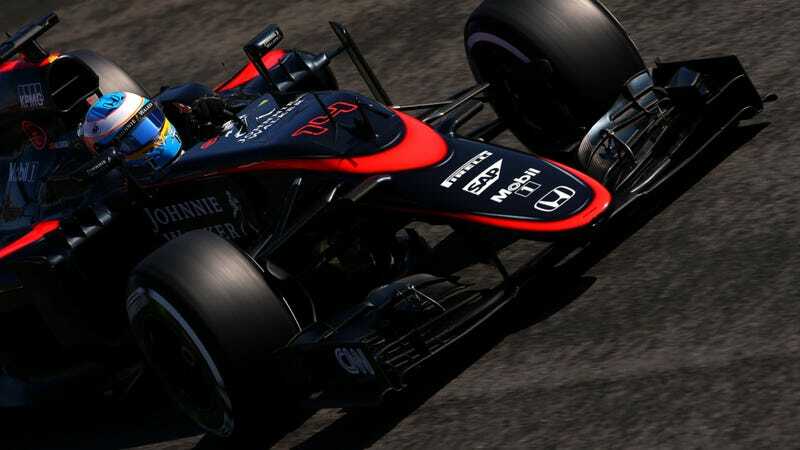 “Fernando and I gained so many places on lap one in Spa - and lost everything on lap two!” Button told Formula One. Who doesn’t get any love at all at Monza? Max Verstappen, who not only had a 20 place grid penalty for power unit changes, but failed to qualify after his engine cover blew off in qualifying. According to Motorsport.com, Verstappen was already on his seventh and fifth power unit elements (of only four allowed!). He received an additional 10-place penalty because his crew broke the seals on his engine in the rush to send him out to qualify. That means F1 will count Verstappen as having used his eighth engine, anyway. Oops! Additionally, Verstappen still has to serve a drive-through penalty for the unsafe release of his car without the engine cover fully attached. Fortunately, F1’s new leniency on penalizing teams for too many penalties means that Verstappen’s the only drive-through assigned ahead of the race. Heeeeeeey Haas F1, this may be your opportunity to pick up a few soon-to-be ex-Toro Rosso crew members, but I’m not sure you’d want them. If anyone got hosed without a penalty, though, it’s Nico Rosberg, who had to revert back to an older spec Mercedes engine in qualifying after running into issues during practice. Rosberg now starts in fourth position, behind both Ferraris of Kimi Räikkönen and Sebastian Vettel. Road & Track points out that this is the lowest starting position ever for a Mercedes W06 car. Mercedes’ Lewis Hamilton starts out in front, and Tifosi everywhere are hoping he suffers whatever befell Rosberg’s car. According to BBC F1 presenter Jennie Gow, Mercedes admits that leaving the faster new-spec engine running new fuel in Lewis Hamilton’s cars is a bit of a risk reliability-wise. They didn’t have time to swap both engines, though, so only Nico’s running his older engine. Rosberg’s engine is six races old—an eternity for a Formula One power unit. Could we see a Ferrari win their home grand prix, then? Given the number of times Monza has been won from pole, it’ll probably need gremlins to show up in that Mercedes power unit for that to happen. Yes. Actual, literal fuzzy gremlins. The full starting grid can be viewed here. Is it 2016 yet? This is the wrong kind of record-breaking season.